The Brigitte Bardot got a tear in an ama which is widening, while the Steve Irwin needs 20 hours to arrive and save the crew. Let's hope nobody gets hurt this time and the Steve Irwin also manages to save this tri so that she can fight the whalers once more! It is said that it was a freak wave that did the damage. Dang those freaks waves! They seem to get everywhere - who would have expected a large wave 1500 miles south of Australia . or a huge mass of hypocrite. Their facebook page says the Steve Irwin has her under tow now. I really wondered at the wisdom of using such a modern design when they launced. It struck me as it might be untried. It seems every time anyone has problems after an encounter with a big wave they are going to call it a rogue wave, whether it really was one or not. Of course it might have been a rogue; maybe it was just a *thug wave? Instead of the cool new boats they should by a retired boat from the navy one that is FASSSSSSSST! and maybe with a few missiles on board. If your ship doesn't come in, swim out to it! How about this? She was Churchill's favourite in WW2, and the fastest thing in the British fleet. I think she did have a slight fuel consumption issue, though. 171 litres of gasoline engine! 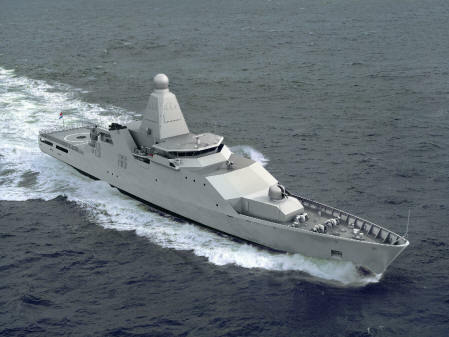 So they should choose a Dutch patrol ship of the Holland class which has environment friendly electric drive besides diesel! Where does the electricity come from for the electric drive? Presumably, the diesel engines. A sad and scary story, but the article left out an important detail. It said they were in 20' seas but that it was hit by a "rogue wave." I wonder how big that wave was? That's the kind of thing that will give you nightmares. My thoughts too. Do the media, generally, really know what a rogue wave is? No, the electric drive is fed by the normal gensets, for low power manouvering etc. the big diesels can be switched off then. It's called CODELOD if you want to Google it. It is a strange beast and does look a bit weak in the almas for it's size. As of 30 December 2011 the Brigitte Bardot was being escorted back to Fremantle by the SSCS flagship, MY Steve Irwin. The main hull was cracked and the port side pontoon was being held together by straps. The vessel was moving at 7 knots (13 km/h; 8.1 mph) with arrival in Fremantle expected in five days. An ugly beast not at all Bridget Bardot like.